What a day. I woke from a deranged nightmare in which I was teaching the Cardinal Ghost how to make pancakes by screaming the instructions at her. Then I was interviewed by Ali Gharib, who writes for the Nation Institute. After that I learned that a post of mine has caused a famous writer to have brickbats thrown at his head. All of that is moot, because there was no father. Mr. Gharib was very upfront that he didn’t consider me a credible source, which is perfectly accurate. I’m not any kind of source. I knew he’d present me as a lunatic because one of his final questions was about this photo I took. 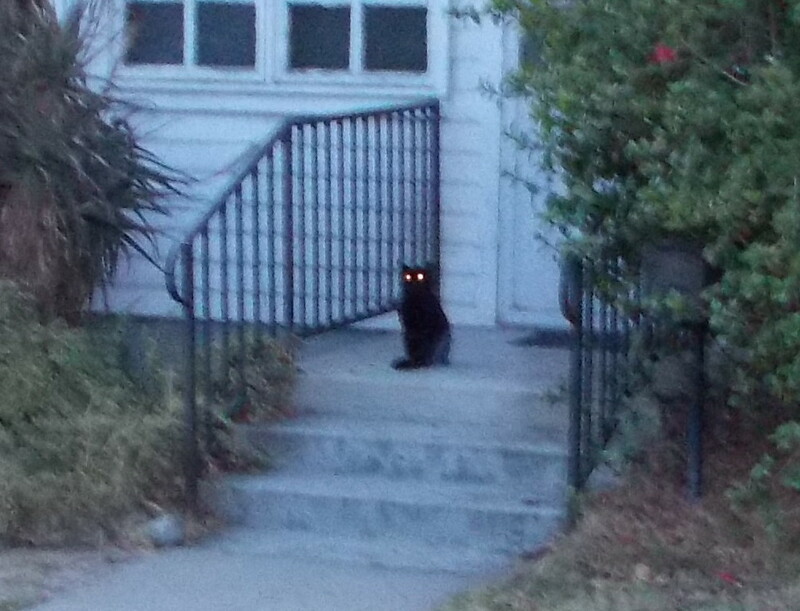 That cat showed up on my front porch, looking and sounding exactly like my late cat Syd the Second, who died August 22, 2011. 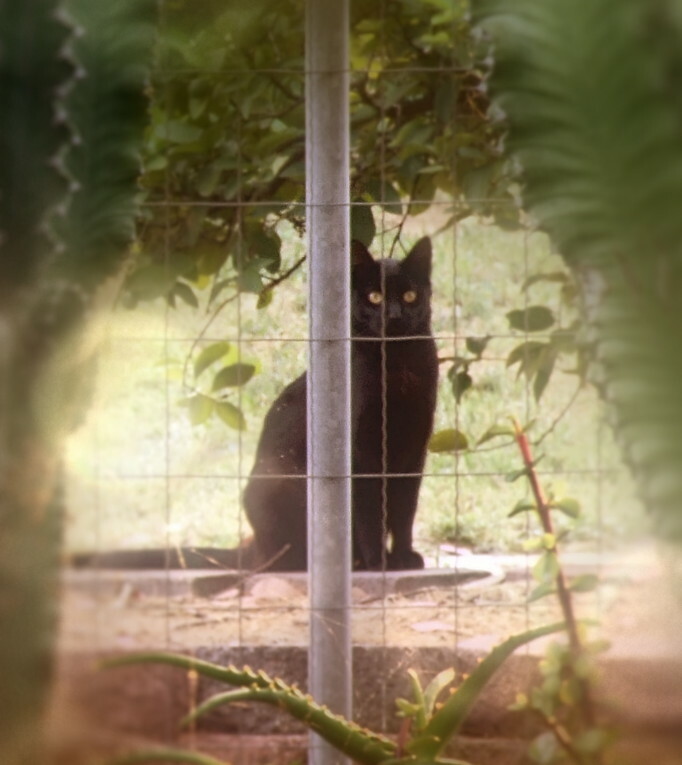 In the photo, the black cat’s eyes are glowing—despite it being daytime—and its hindquarters appear to be dissolving into gray smoke. 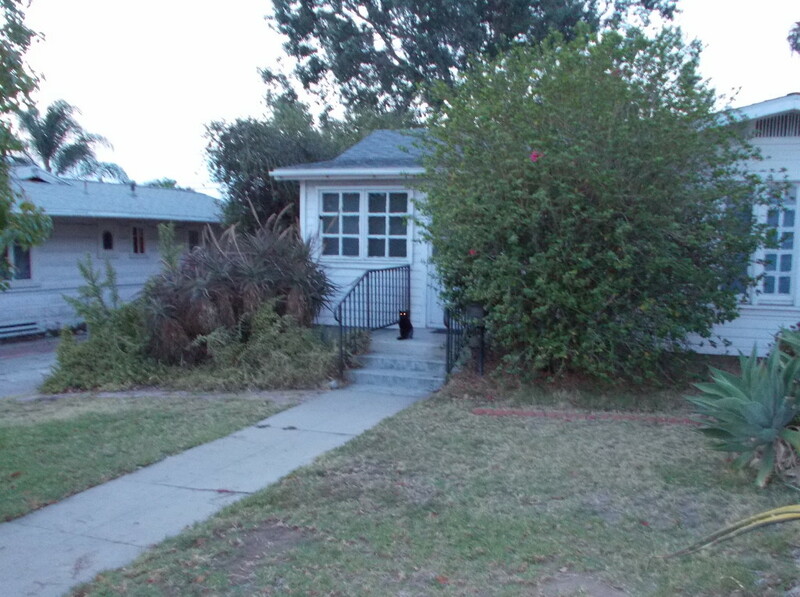 When the shutter of the camera opened, the cat was gone. Here’s what I wrote about the photo. Syd, if that was you, thanks. But please-please-please don’t come back for good until Tim and I are settled in Texas, okay? There are enough qualifiers to satisfy any skeptic, but I knew what Gharib would write: I was crazy, barking mad, bats in the belfry, loony tunes. Gharib also used the fallacious debating technique of “argument from authority,” also called “appeal to authority.” He said that hugely prestigious news outlets like The New York Times, the Associated Press, and Reuters must be believed because they’re authoritative. I understand that since he’s a journalist, he finds it hard to accept that massively respected news outlets use fake imagery or fraudulent information. Well, just look up Adnan Hajj. 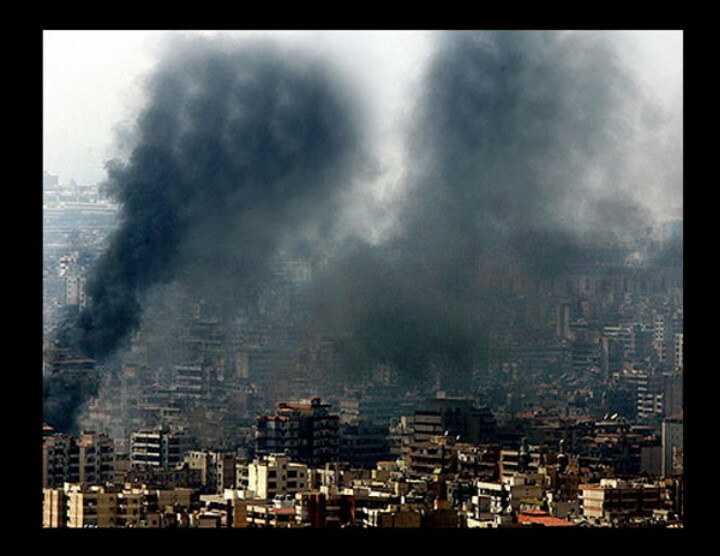 He manipulated photos for Reuters during the Second Lebanon War in 2006. They were so amateurishly altered that it’s impossible for Reuters to not have known. Brian Walski was fired from the Los Angeles Times after he falsified a photo. 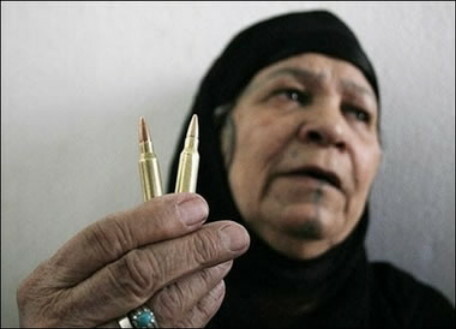 During Operation Iraqi Freedom, Agence France Presse published a photo of an Iraqi woman who said American troops had fired these bullets at her house. The problem is that those are unfired cartridges, not bullets. Maybe American troops used slingshots to fire them at her house. This led to one of the funniest videos ever made, Like a Suppository, Only a Bit Stronger, by the Dissident Frogman. Scroll down to the screen. Big, old, reputable news organizations publish fake material all the time. We currently live in an era of journalistic laziness combined with inflated self-regard. Most journalists love to talk about how vital they are in “addressing injustice.” You’ve heard the news slogan, “If it bleeds, it leads”? That’s not true. It depends on who’s bleeding. If I wanted to, I could direct you to a link of Boko Haram terrorists murdering Christians in Nigeria by cutting their throats and dumping them in a ditch. I could show you photos of Ukrainians blown to pieces by separatist mortar shells. The only war the press cares about is war waged by Israel and the United States. So even though I have nothing against Ali Gharib personally, I despise his profession. To recap, I wrote a post titled “More Palestinian Fakery.” David Frum of The Atlantic tweeted about it, and then something called BagNews wrote “David Frum Accuses NYT and Reuters of Staging Gaza Hospital Photos (Graphic).” The title is a lie; Frum—like me—accused Hamas of staging the photos. BagNews had to resort to lying to make its case. On Twitter, people who eat, breathe, and sleep Israeli military action have accused me of being a “truther,” meaning someone who engages in conspiracy theories based on the flimsiest of evidence. As I told Ali Gharib, my posts are just opinion. Of course I could be wrong. But David Frum has a salient point: Why would Hamas fabricate civilian deaths if they had so many real ones to choose from? Another part of the answer is that the world has Muslim-war fatigue. And we also see how Hamas uses children as human shields and breaks every international law of warfare. 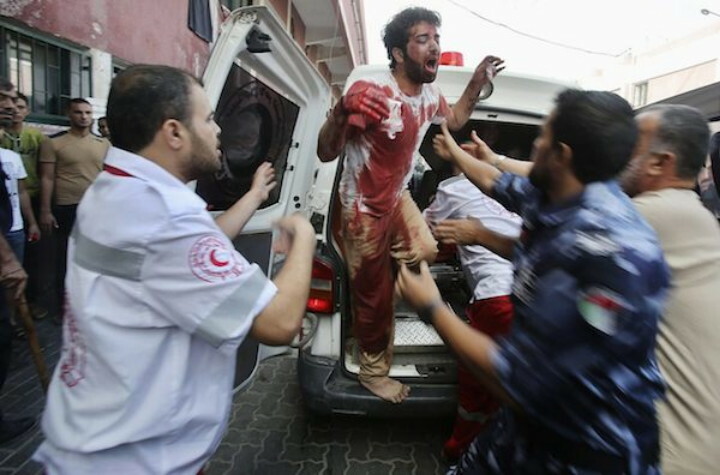 Public opinion starts to turn, so Hamas creates more and more victims. 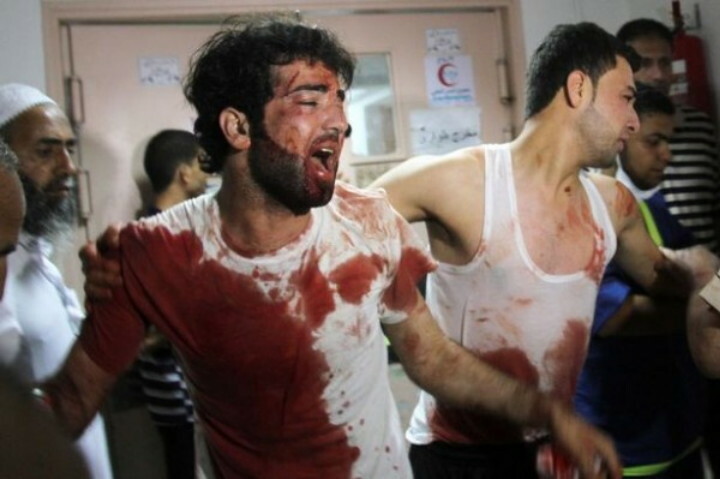 I was immediately sure that the photos of the Crying Man covered in blood were staged. 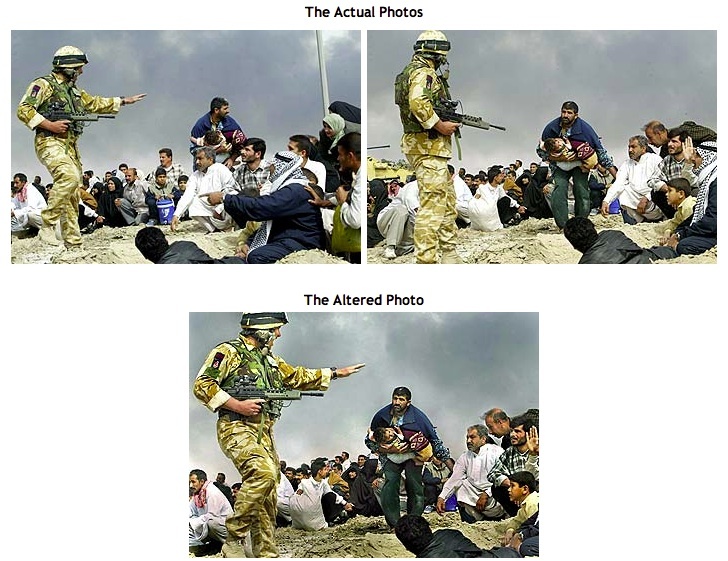 That doesn’t mean that the photographers and reporters conspired with the Palestinians to create a fraudulent story. My point is that the world takes Palestinian casualty numbers, anecdotes, and photos at face value. It’s the narrative: The Palestinians are the underdogs, and Israel is the fascist, pariah state abusing them. I believe that there’s also a level of Jew-hate involved, since the media doesn’t report on the genuine atrocities deliberately committed by Hamas. Those are mentioned in passing and then discreetly buried. People have e-mailed me, telling me that the BagNews piece completely debunked my post on the Crying Man. It didn’t, because the writer argued against things I never said. The article also provided me with new photos. I hadn’t gone looking for more because I’m not obsessed with Operation Protective Edge. I know what the outcome will be, and I support Israel. Beyond that, I have a life. But the BagNews piece included the photo above, which shows shows that the Crying Man has no concrete dust on him. His father was killed in an Israeli air strike on their house. If the Crying Man was close enough to be soaked in his father’s blood, he should have at least some concrete dust on him. But he doesn’t. Not a speck. There was another photo of the Crying Man getting out of the ambulance at the hospital. Here’s what New York Times photographer Sergey Ponomarev said about this image. In one ambulance there was a heavily injured older man and two younger men, and one of them was covered with blood and really upset. He fell on his knees, calling on Allah and gesturing. Remember that. The ambulance carried a heavily injured older man and two younger men, one covered with blood. Ponomarev said the ambulance was immediately surrounded by a large crowd of security, medical personnel, and civilians. There are no pictures of the father’s body, another thing that bothered me about this story. Palestinians aren’t shy about displaying their corpses for the cameras. You can find photos of parents holding up dead children who’ve had their faces blown off. With the above photo in hand, I did a Google Images search and found a version with higher resolution. I enhanced it and solved the riddle. 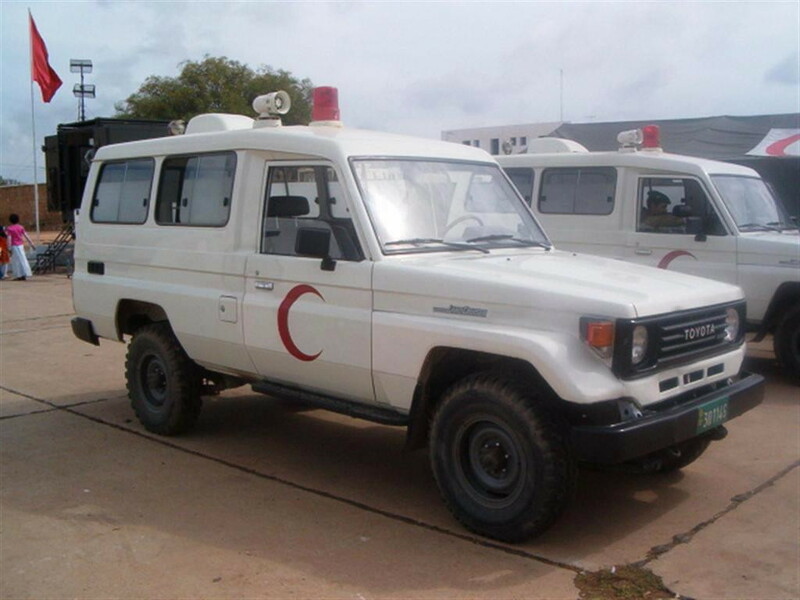 The Crying Man arrived in a Toyota Landcruiser Hardtop ambulance. 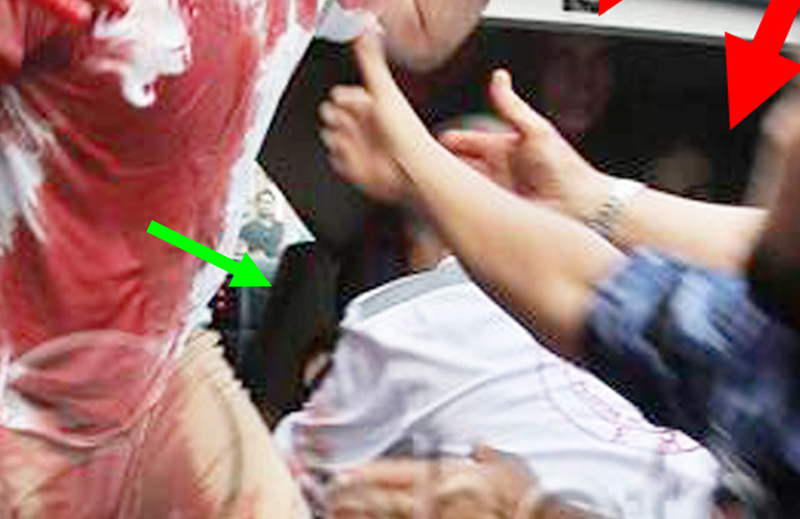 Here’s the enhanced photo of the Crying Man stepping out of the ambulance. The re arrows mark two impassive young women sitting on the bench seats closest to the door. 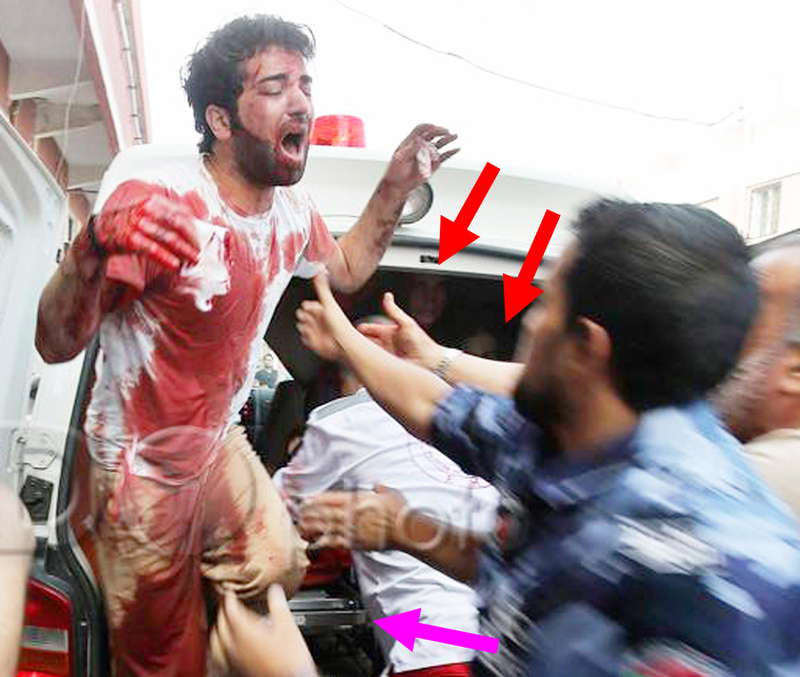 The Crying Man is in the act of stepping out of the left side of the ambulance. Sergey Ponomarev said there were also a heavily injured older man and another young man. Since a paramedic would also have been in the back of the ambulance, that’s one older man, two younger men, two women, and a paramedic. Six people. 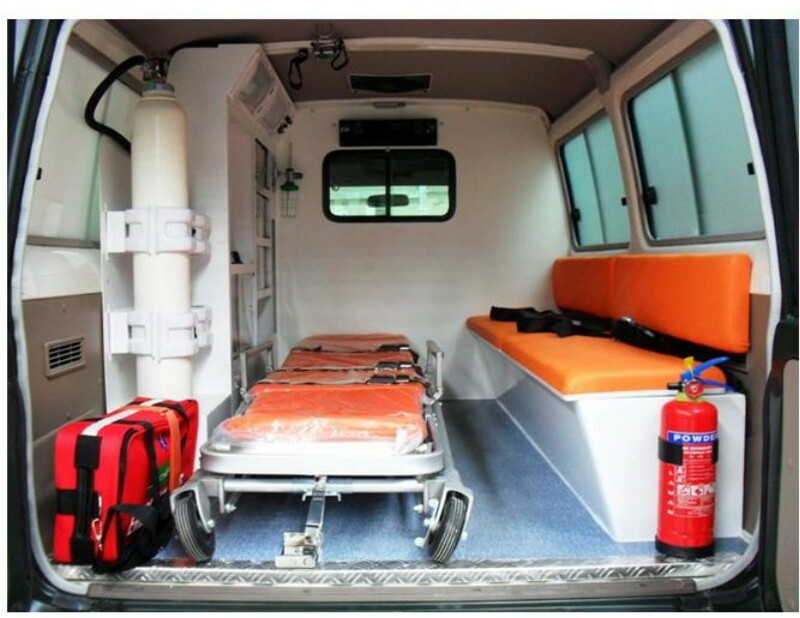 This model of ambulance can seat only two passengers in the back. Because of his position in the photo—as well as that of the paramedic in the white shirt—the only place the Crying Man could’ve been was on the gurney, marked with the violet arrowhead. None of us believe that he lay on top of his dead father during the ride to the hospital, so we must conclude that there was no dead father. The upright back of the gurney (green arrow) shows that young man was sitting there, right before he exited. And that means the photos were staged and the story fabricated. My contention is bolstered by the fact that Sergey Ponomarev didn’t record a single image of the dead father. Why not? He was wheeled right past Ponomarev, wasn’t he? As I explained to Ali Gharib, it doesn’t matter if people believe me or not or find me credible or not. The “credibility” issue is a red herring. My own troubled brain should have no impact on how you use your own eyes and brains. Besides, my post-traumatic stress disorder (PTSD) doesn’t manifest itself as hallucinations. I dissociate, meaning I lose track of time and enter a dreamlike state. The anonymous BagNews writer is a clinician, so he must be Michael Shaw. He says I’m “struggling with mental illness[. ]” An ethical psychologist—having read my own description of my mental issues, as Shaw says he did—would explain that my PTSD doesn’t make me a gibbering maniac. But Shaw took the easy way out and told his readers that I’m completely insane. Here are the tags to Michael Shaw’s story. Some are flat-out lies. Nobody accused anyone of “doctoring” photos, and Shaw also deliberately misrepresented my statement that the photos were staged. He knew full well that I meant by the Palestinians, but he pretended that I was accusing the photographers of staging the images. This is why I’m apolitical. Even psychologists—who are supposed to help those of us in need—let themselves become morally corrupt in the name of political orthodoxy. Shaw hates conservatives, so he lied about me in order to bolster his cause. He wrote a hit piece on David Frum, and I was just collateral damage. Nothing personal, chum! The Ali Gharib piece, “David Frum’s Sources.” He misled me by saying that he wrote for the Nation Institute. I wouldn’t have given the interview if I’d known that it would appear on a blog. It’s just another hatchet job on Frum. Oh well. I was once a journalist. One of the reasons my career failed was because I refused to lie to and about interviewees. Ali Gharib calls me “unwell.” He also doesn’t believe that Pallywood exists. Which one of us is unwell? This article viewed 9733 times.